Paris, January 6, 2006 - There's one of these towers in Las Vegas, and another one in Epcot Center. But I've been told that the one in Paris is older. It's certainly bigger. Orlando and Vegas don't get as cold and dreary as Paris does in January, though. 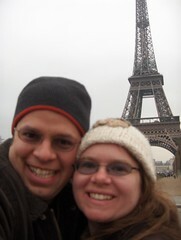 Paris certainly won't be cold and dreary when we're there again next week! I was there for the first time ever this past January, and I certainly wanted to go back sometime; I never expected that it would be so soon. Sue just found out two days ago that her efforts to finagle a business trip there were successful. Not only that, but her company is nice enough to fly me there, too (business class!) and to put us up in a five-star hotel for five nights. How's that for a nice surprise? The catch is that we won't have much free time - Sue's supposed to be schmoozing clients (and, by extension, I will be, too). Another catch is that I'll have to wear a blazer for dinner every night. This in a country that apparently does not believe in air-conditioning or ice.